It rains all day. 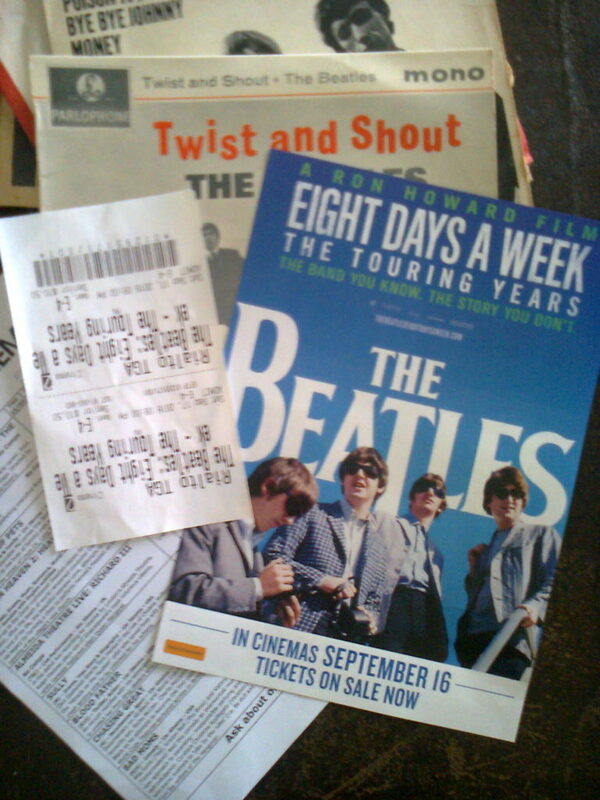 Last night I’d decided that today I’m going to make that 17 minute drive uptown to check out the Ron Howard documentary detailing the Beatles as a touring performance rock and roll band. It’s raining as I ring to book my ticket. “You’re the first”. I reply I’d expected every aged person in the district to be there tonight. She laughs. It’s still raining when I leave. It isn’t fog that engulfs my car as I slide over the newly graded road waiting to take my gravel road to extinction; it’s low cloud. The car lights bounce back at me saying “stay at home – stay at home”. A car pulls out of a drive at the end of the road and the driver makes a concerted effort to blind me as I slowly inch down the treacherously wet and slippery Whakamarama Road but I’ve seen enough crumpled heaps on Sunday morning not to be intimidated and my progress towards the Old Highway remains the controlled driving of the knowing. The low cloud has disappeared as I have entered the lowlands. I spend ten minutes in the Bethlehem Countdown deciding on which is the best chocolate buy for the $2. I’ve decided to invest in my Saturday night special. Turns out to be a tablet of salted caramel. I’ve raided my piggy tin for this and want the best and the biggest for my $2. 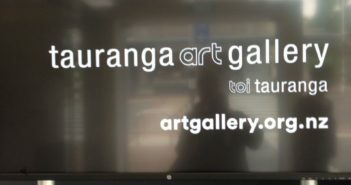 Tauranga has progressed since the first time I came in one Sunday night in 2008 to go to the Rialto – then the place was as quiet as a virus decimated city of future fantasy – not a soul in sight – no homeless – not even a homeless dog. Tonight, seven years later, I’m unable to get a park in Grey Street or the adjacent streets close to the Goddard Centre. I drive back and park on Durham Street outside the main entrance to the new Trustpower building – it has its uses. Since my interview with Councillor Catherine Stewart I look with fondness on the bumpy cobblestones in the Spring Street-Grey Street intersection. Now I know what they represent I conspiratorially take ownership of them and no longer resent the lumps and bumps. I walk past the statue-fountain on the corner of Grey Street and determine to find out what it means – at the moment all I can think of it’s ugly but once I know what it represents I know I’ll love it. Can’t believe it Art by Rosie is open. And, there are Neil Isaacs and Rosie Harper with Beatles music, wine and Beatles art. Rosie has a series of Beatles music-inspired paintings and has been working away in her studio-gallery on a range of detailed black and white images. Neil turns the Beatles music down so we can talk. No, they haven’t had a stream of people in to see them – odd I think. Then I mention my ticket booking experience. Maybe I’m having another “who is Hank Marvin” moment. We talk and then I belt up the stairs to get my ticket. There are about half a dozen people seated in the black leather armchairs opposite the Rialto ticket office and concession area. 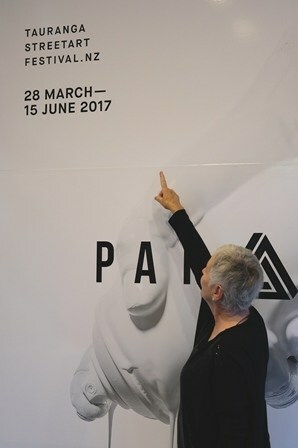 I pay for my ticket and mention the art and exhibition downstairs – the lovely young man points me to the poster by Rosie on the wall. A stream of people coming out of the theatres pass me. I race back down to see Rosie and Neil and share the news that the crowd tonight is elsewhere. By the time I get back upstairs the black leather armchairs have been vacated. I check the visual display, remembering a flight to Australia where I spent a considerable amount of time trying to find my booking number not the flight number. I run up the stairs to Theatre 2. 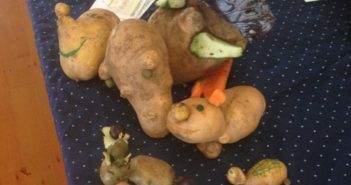 There are six people in there – 3 couples. As I’ve been going to the cinema and shows unaccompanied since I was at school in Auckland that doesn’t faze me but I’m shocked by the size of the audience. I take off my hat, take off my coat, unravel my scarf and sit on the seat at the very end of the back row (old habits die hard) and open my salted caramel chocolate. As I blissfully dissolve the thin, hard tablet on my tongue a poncho covered young man slopes into the theatre. Even though there are only seven of us in the place he assiduously tries to read his ticket with his allocated seat number on it. As there are only seven of us in the place I decide he must have been to boarding school. Finally he slides into a seat towards the middle, later he moves – so he is sitting at a distance from the rest of us who hug the two back rows. I spent some of my youth in the murky depths of Auckland teenage-focused music clubs and now have to lean in to hear some of the more mumbled conversations I’m involved in. But, I have no difficulty hearing the opening advertorial sequences in the Rialto which are so loud I am metaphorically pinned to my seat. I don’t think I’ll be coming back to see Bridget Jones’ Baby but then you are talking to a woman who cried throughout Muriel’s Wedding because it was such a classic study of abuse. The doco starts and I’m absorbed into the past. Not in any nostalgic way. It’s too good for that. This is insight. This is being there. I see a TEAL bag in the studio – who would have thought “the fab four” would have kept a New Zealand airline bag. 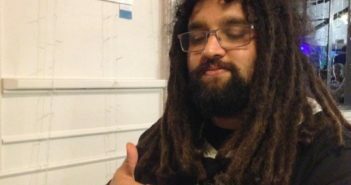 I’m taken aback by the amount of smoking – but I used to smoke. I am overwhelmed by the talent. I’m overwhelmed by the ability. I’m overwhelmed by the musicality. Most of all I’m overwhelmed by the humour the self-deprecation. I’m also amazed that four such intelligent people managed to play that game for so long. It is interesting to see the imperceptible descent into disengagement. It’s interesting to see the lizard-like image of Epstein standing at the side of the Shea Stadium concert and to see the upper-class besuited Epstein and Martin knocking the working class boys into a marketable product. Nothing changes. I went down to the Capital in Te Puke to see the film of Elton John in concert and a documentary about The Rolling Stones. This is better. 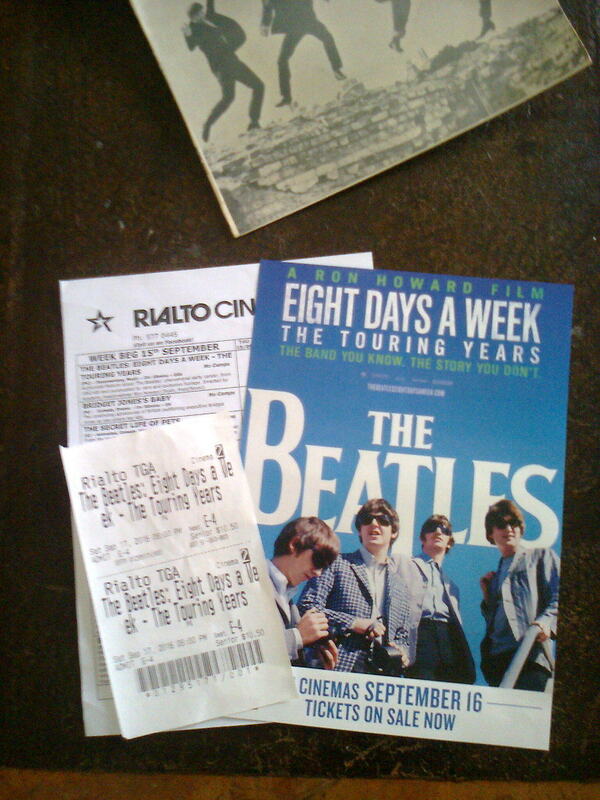 Yes I was a Beatles fan. I had a soft maroon squishy red cap, a bright red mock astrakhan collared cape, thick black stockings and ankle Beatle boots. When I see the audiences in the concerts I realise I didn’t look like them. 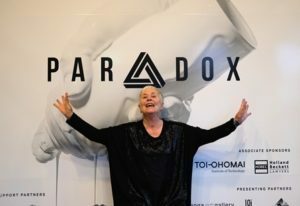 I’m sitting in a darkened theatre in Tauranga and I’m smiling – I’m smiling because as a young person I experienced something amazing. 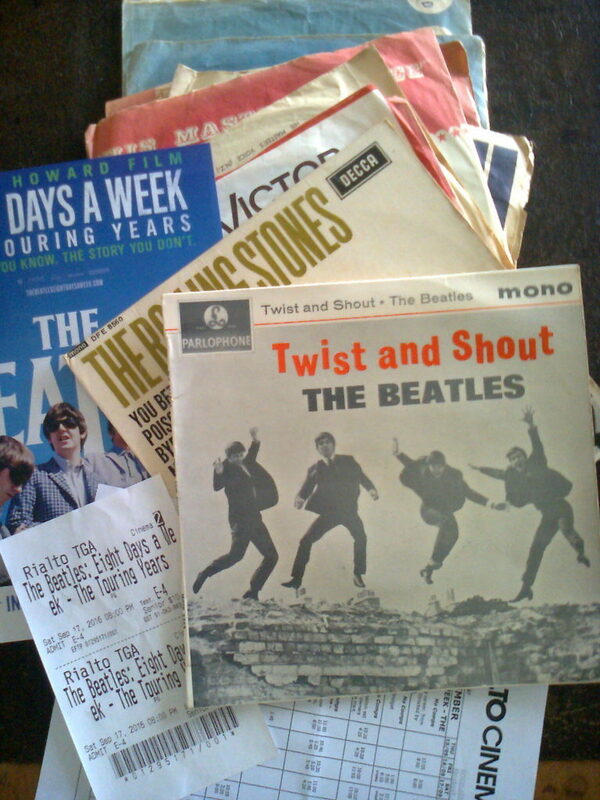 A young woman in England used to post me records. Yes she lived in Cheshire and yes she posted me Beatles records. 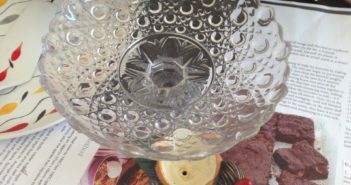 I realise now what I experienced was as amazing and socially transformative as the world of the University Maori Club – only then I didn’t know it. Now I do. Most emotional moment – when I hear the Beatles refused to perform in front of Southern segregated audiences – they wouldn’t and we hear what that meant for young black members of their audience. See if it is available to download or as a DVD. And the digitally enhanced 30 minute concert at the end of the documentary – wait till you see the final number and you’ll see what they were all about – performance, enjoyment and talent – deeper than the sea. 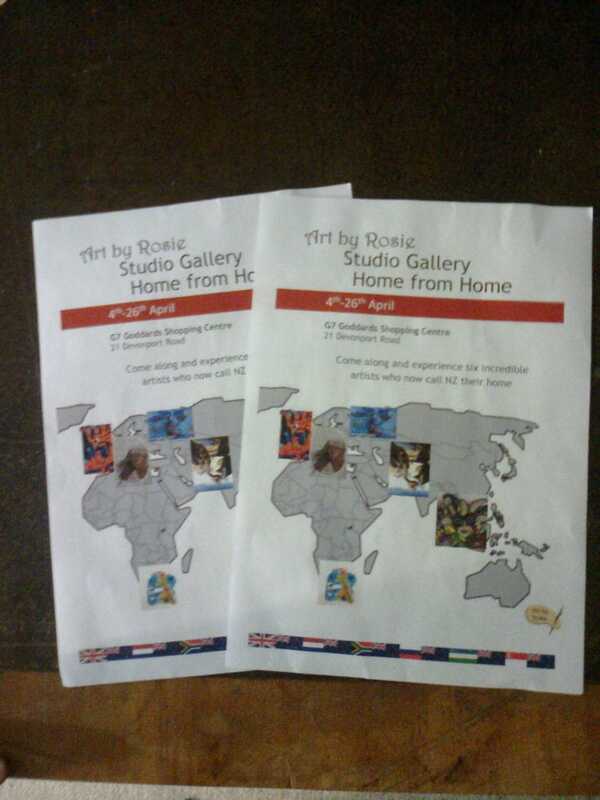 Art by Rosie, Studio Gallery has a multi-artist exhibition – “Home from Home” Six artists of international origin who now call New Zealand home exhibit their incredible work. 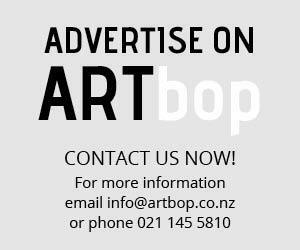 The exhibition runs from to 26th April at G7 Goddard Centre, 21 Devonport Road, Downtown Tauranga. You’ve got until Wednesday 9th June 2017 to enter. Info and registration on line at www.envirohub.org.nz This is an event where innovation and style rival WOW in the creativity of the entrants. 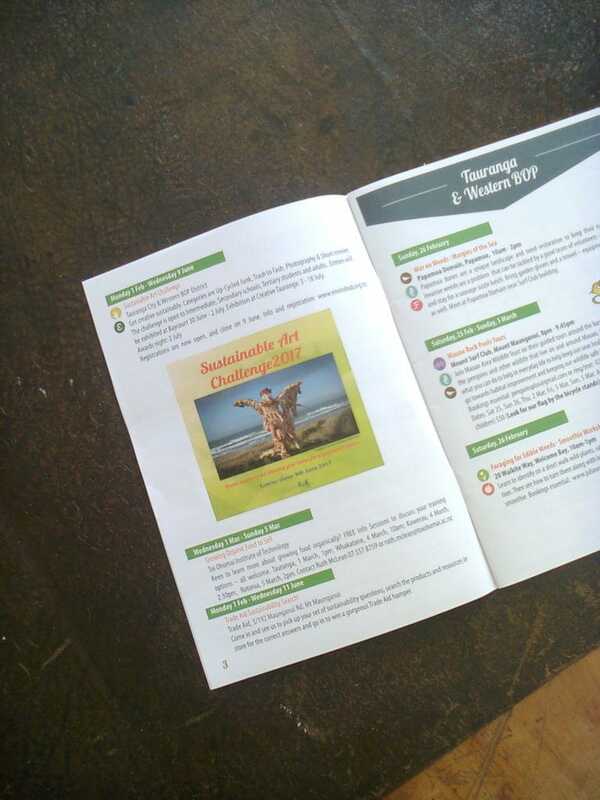 Take a look at the articles on ARTbop about last year’s SAChallenge. We take a look at the setting up of the display in the Baycourt XSpace and then the exhibition of winners at Creative Bay of Plenty, Willow Street, Downtown Tauranga – innovation and style. 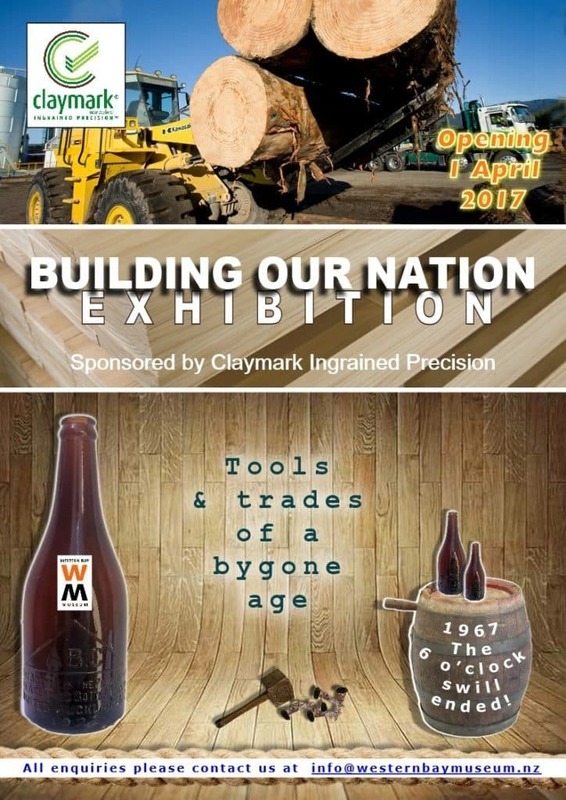 The Western Bay Museum Katikati new exhibition “Building our Nation” on now.